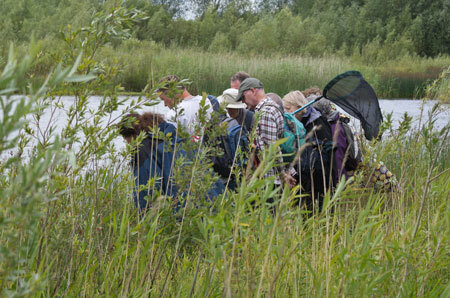 On this occasion, as a relief from hard labour, and perhaps as a reward for it, volunteers were treated to a guided walk in search of damselflies and dragonflies led by local ecologist, Ian Smith. While the weather was not ideal for seeing lots of dragonflies on the wing, with the day starting cloudy and a little breezy, there was still plenty to see and learn. Dragonflies and damselflies spend most of their lives in the water as larvae and emerge into adults during the summer months. 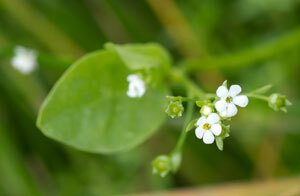 This involves the insect climbing out of the water, often along a plant stem. It then has toextract itself from the larval case, unfold its wings and warm itself up before it can fly off. During this process, which can take several hours, the insect is vulnerable to predators, mainly waterfowl, such as ducks and coots, foraging on the surface of the water. Different species have evolved various strategies to minimise the risk. 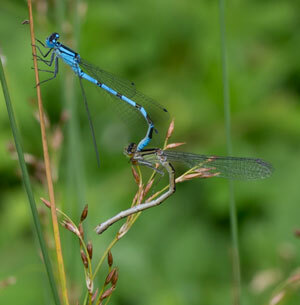 The larger dragonflies emerge at night, while damselflies, which generally emerge during the day, climb up as far as possible out of the water so they are above the easy reach of waterfowl foraging at the water’s edge. 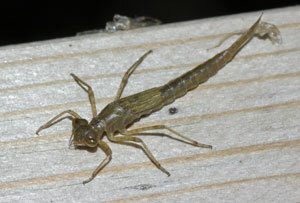 The larval cases, known as exuviae, that are left behind are therefore good evidence of dragonflies and damselflies breeding in the water. 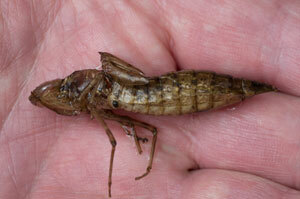 Exuvia of Emperor Dragonfly (Anax imperator) recovered from northern edge of Thrupp Lake. Much of the morning was spent looking for and collecting exuviae along the northern shore of Thrupp Lake. These were mainly of the emperor dragonfly, Anax imperator, the UK’s largest dragonfly, and one which is often seen in flight around the lakes. 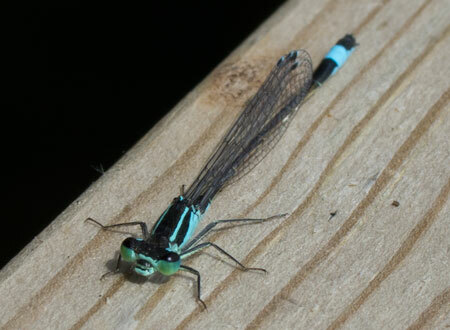 There were also coenagrionid damselflies (common blue and blue-tailed damselflies) emerging on the wooden structure of the bridge across the NW corner of Thrupp Lake. One was found just beginning to emerge from its case, and this was recorded for the first 5 minutes before we had to move on. The wings, which are rolled up into four finger-like tubes are now clearly visible. 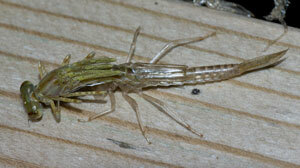 This shows how the damselfly extracts itself fom the case. The case is broken across the back along base of the thorax and the front part pushed forward creating a hole large enough for the adult to emerge through. The head is pulled out first, then the tail. Afterwards, the empty case springs shut leaving one wondering how anything that was ever inside could have got out. The weather was gradually improving and the sun began to peek through the clouds. While walking along the western shore of the lake, we encountered both Common Blue (Enallagma cyathigerum) and Azure (Coenagrion puella) damselflies among the lakeside vegetation. 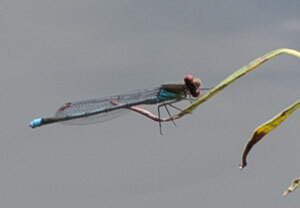 A large Red-eyed damselflied posed on a sprig of vegetation some distance out over the lake just in front of the bird hide. posing on a sprig of vegetation over the lake. 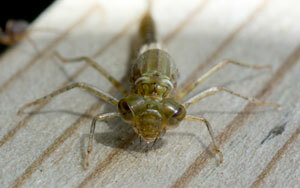 A male Common Blue damselfly (Enallagma cyathigerum). by the shape of the black mark between the first two abdominal segments. The walk proceeded to Orchard Lake to the south. This is one of Radley’s most spectacular ‘lakes’ and is an excellent site for many species of wildlife, including dragonflies. Here our guide netted an adult Emperor (Anax imperator) and showed us how to handle it by its wings without harming it. In this way, it was possible to obtain some spectacular closeup shots of this amazing insect before eventually releasing it unharmed. Three hours having elapsed, it was time to return to Sandles for a welcome cup of tea and some biscuits. plus a few as-yet unidentified things. 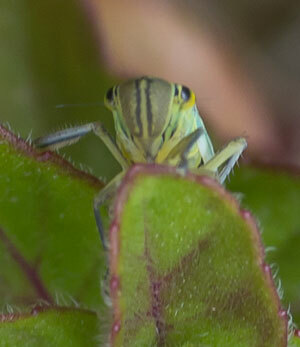 A blue/green leafhopper (Cicadella viridis) poses for a photograph.